Microsoft announced today that it plans to make Internet Explorer 11 available to the company's operating systems Windows Server 2012 and Windows Embedded 8 Standard. Internet Explorer 11 (IE11) is the last version of Internet Explorer that Microsoft released. The company made the decision back when it was released to limit support to some versions of Windows; this meant, essentially, that operating systems such as Windows 8, Windows Server 2012 or Windows Embedded 8 Standard were not support. The release history of Internet Explorer for Windows Server and Windows Embedded operating systems is quite confusing on first glance. Microsoft did not release IE11 for Windows Server 2012 but it did release the browser for Windows Server 2008 R2 Service Pack 1. Similarly, Windows Embedded 8 Standard was limited to Internet Explorer 10 while Windows Embedded Standard 7 received Internet Explorer 11. Microsoft revealed that it will make Internet Explorer 11 available for Windows Server 2012 and Windows Embedded 8 Standard operating systems. The decision had to be made because support for Internet Explorer 10 security updates ends on January 14, 2020. Internet Explorer 11 will be released for the two operating systems; administrators may download IE11 from Microsoft's Update Catalog website or distribute it using Windows Update or WSUS. Spring 2019: Internet Explorer 11 will be offered to commercial customers that run Windows Server 2012 or Windows Embedded Standard 8. Later in 2019: Internet Explorer 11 will become available through Windows Update and Windows Server Update Services. January 2020: end of support for Internet Explorer 10. Microsoft won't release security updates for the browser anymore. Updates for Internet Explorer 10 and 11 will be labeled as such. Updates for IE10 are labeled Cumulative Update for Internet Explorer 10, and updates for IE11 as Cumulative Update Internet Explorer 11 on all update platforms and the Microsoft Update Catalog. Organizations need to upgrade Internet Explorer 10 on these devices to Internet Explorer 11 to receive security updates for the built-in web browser. Microsoft notes that companies may use Enterprise Mode for application and website compatibility, and that migrating to IE11 will "ease the migration path to Windows 10, Windows Server 2016 or 2019, or Windows 10 IoT". Internet Explorer comeback after Edge fail. Epic. It’s not meant as a comeback at all. It’s only meant to streamline support costs for Internet Explorer. Get all supported Windows releases on one version. Microsott’s future is Blink-based Edge. Well not all. Win2008 is still on IE9. But support for Win2008 ends next January, so then its just one IE. @Nico: Yes as of January 2020 – that’s what I mean. Vista-ish OS builds are off the tale in a year. Kinda late for that, don’t you think? On Windows 10 Firefox 65 is the number one for me to go to with different profiles and main number two browser is Vivaldi (Sometimes I also use chrome and or Waterfox.). Martin ( Or anybody else who knows this), in your article you are showing Microsoft Internet Explorer 11 version 11.0.6300.1648. Update version RTM (KB281134) do you know maybe or when you have installed like me Windows 10 Pro version 1803 build 14134.523 with the Microsoft internet explorer 11 version 11.523.17.134.00 Update versions: 11.0.105 (kb4480965) this newer MSIE 11 version when out of prerelease, will also be installed on the builds 1803 and 1809? I cannot remember. The screenshot is from an old article, not from a recently updated version of Windows. I think the first one should say IE10 and not 11. Here’s hoping I can install IE 11 on Windows 8 (since I can also install Server 2012 updates on Windows 8). I actually remove the browser on Windows 8 (just leaving the IE 10 engine in tact).. I wonder if I could still do that with an IE 11 installation. It was dropped today. 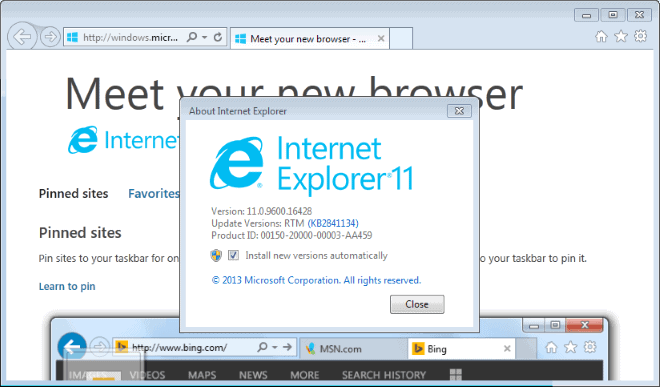 IE 11 for Server 2012 has finally been released. So far I’ve been unable to install IE 11 on to Windows 8. I tried the Embedded and Server 2012 issues. Now in fairness, I have removed IE 10 from the Add/Remove Components back when I installed Windows 8, so maybe there’s a connection.